I work in Northwest Portland near Good Samaritan hospital. They have a wonderful healing garden that I try to walk through about once a month just to take a moment to slow down. After spending a lot of time in hospitals and health-related facilities recently visiting loved ones, I have a new appreciation for these places of respite. This one, the Stenzel Healing Garden, is special. Let's take a walk-through. Here is the entrance I usually take, right off of NW 22nd. It's kind of hidden, but welcoming. If you are a plant person, the greenery will draw you in before you even know where you are. I really appreciate this concept. I do believe in my heart of hearts that gardens are therapeutic both for viewers and those of us with their hands in the dirt. There is a really comprehensive native plants section--a couple, actually. The garden is very well-established and lush year-round. Some of the healthiest salal I have seen. Salal, deer fern and wild ginger present a nice tapestry of textures. The garden is divided into several large raised beds. There is a sunny butterfly garden, a rockery garden, the above-mentioned native garden(s) and others. It feels like a secret garden. Cheerful, sure to make you smile. Some plants are labeled, such as this saxifrage. Not all are, and that's ok.
Well-deserved, I believe. And by the way, the garden is open 24 hours a day, every day. Good thing about taking damp soil. Lovely tree. The Alasksa weeping cedar tree. More of the native garden with established mosses, vine maples, rocks and ferns. Really a sight to see any day of the year as it is cool, evergreen and calming. A nice mix of benches for resting, hard-scaping, trees, shrubs, perennials, birds, insects and people. Truly a garden for everyone to enjoy. A quiet place for contemplation and fresh air. Here's my favorite, the bun-bun. Detail of mosaic work depicting our own Mt. Hood. In true Portland fashion, a bicycle parking lot. I believe a lot of employees use the garden for parking, lunching and relaxing. Isn't this a fabulous Cornus alba? Love it. Some interesting garden art in the form of metal oak leaves. Yes, help grow the garden. If you are in Portland and would like to volunteer, do call or check out this link. Thank you for teaching me how to garden and love plants, Grandma. Elizabeth Nadine Bown, 1920 - 2014. We love you dearly, you will be missed. G-gma in my garden last summer at age 93. What a true lady. Thank you for reading, and on behalf of someone you love, smell a rose or plant a posey. Happy gardening! Nice your grandma taught you how to garden, I learned it from my grandpa. This therapeutic garden is really wonderful and as you say good for people to look at the plants but also for the people with their hands in the soil. Love the quotes, especially the one of Proust. Yes, I am very grateful to her. Gardening is indeed a healing activity. Thanks for reading! So sorry you lost your grandmother, sounds like it was recent. Great post about the therapeutic garden. Wow, that place is pretty awesome. I'll have to poke my head in next time I'm on that side of the river. That Kipling quote is perfection. I LOVE it. Yes, do visit Mindy! It's wonderful and as I mentioned, open 24/7. Really wonderful place. Oh Tamara, I am so sorry about your Grandma. While mine was a certified black thumb (she embraced silk flowers like they were a gift from god) she did manage to teach me plenty of other lessons. We who got to know ours are the lucky ones, so many do not. I am so glad you enjoy the Stenzel garden. I am a contract gardener for Legacy Health and have worked in this garden many times. 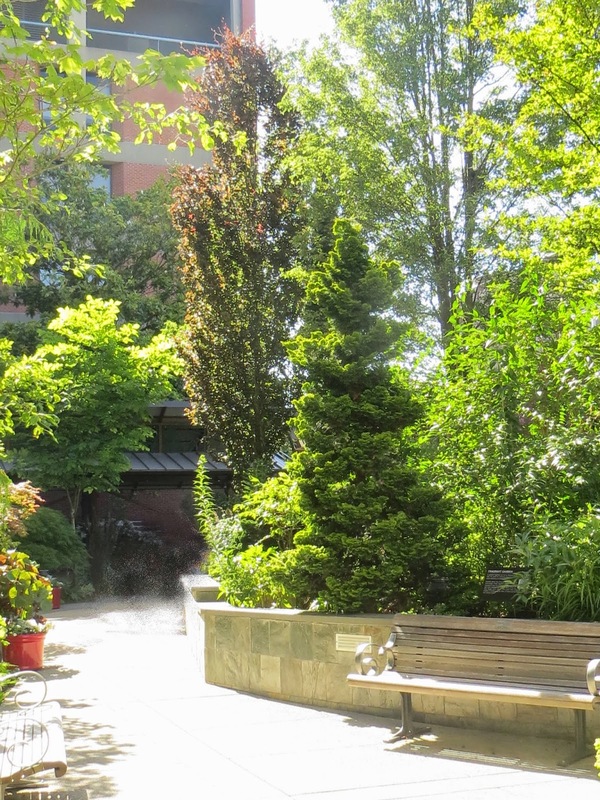 Did you know that Emanuel hospital in NE portland has 4 different award winning healing gardens (Behavioral health, Oregon burn center, childrens garden and a family birth center garden) and that there are other award winners at the Mt Hood hospital and the Meridian Park hospital? I have managed these gardens for three years and it has been a wonderful experience to observe all sorts taking respite in the garden, working on various therapies (occupational, physical, speech), using the garden to grieve, or to relax, eat lunch or wander. Thank you for these amazing photos and post. These gardens are very special to many. Also just curious about the people in the photos. Usually I have to get a photo released signed before I can use photos of patients at the hospital. Thank you for sharing about your grandma. She sounds like she was a pretty special lady. First of all, thank you for all you do with these amazing spaces! They are truly a gift and I so appreciate them. Thank you for this additional information, too. The people, gosh, I never thought of that before and I (very poorly) photoshopped them out, that's a great point to remember. And my grandmother, she was a very special lady, indeed. Thank you for reading and for your comments! I love that garden and I love that they incorporate them into their hospitals. I'm so sorry for the loss of your G-gma. What a gift she gave you with gardening and how proud she must have been of what you've accomplished with it! She's 93 here? No way! What a beautiful soul. I bet you miss her terribly. Your tribute is poignant and heartfelt and it was a pleasure to scroll through such delightful photos.